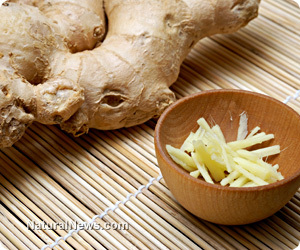 (NaturalNews) Ginger is historically considered one of nature's true wonders. Other than being a very delectable spice, it is known to have a long list of health benefits. It is used to treat conditions ranging from nausea to heart problems. But not a lot of people know that ginger can actually be used as a form of health treatment. What are the different conditions where ginger can be used as a hair treatment? People, especially men, have a higher tendency to lose hair as they age. This can prove especially awkward, as hair loss can dramatically change how a person looks. Because of this, a lot of people worldwide are investing in hair growing treatments with varying results. But if you want your hair to grow back, you must try using ginger. This is because ginger has the natural ability to stimulate blood flow to the scalp. Improved blood flow stimulates the hair follicles and ultimately results in restored hair growth. You can make your own hair growth mix at home with the help of ginger. All you need is a tablespoon of grated ginger. Mix it with 1 tablespoon of jojoba or olive oil. Apply this mixture into your scalp, massaging it in circular motions to improve blood flow even further. After massaging this mixture, leave it on for 30 minutes. You shall experience a warm sensation in your scalp, an indicator that the mix is actually working. Rinse off the mixture. You can use shampoo afterwards if desired. A lot of people are investing a lot of money for products and services designed to supposedly free them from different hair and scalp ailments. Little do these people know that they can actually save a ton of money by going to ginger as their primary source for hair and scalp treatment. Best of all, they can do all these treatments in the comfort of their home and even by themselves! Ginger is inexpensive, practical and effective. What more can anyone want for hair treatment, right?